Games of chance, racetracks and lotteries are regulated at the state level in Michigan. Horse racing venues and casinos based on Native American land are run by the Michigan state, which also regulates the lottery. All gambling activities are regulated by the Michigan penal code chapter 750, which defines gambling as accepting anything of value or money as result of the happening of an uncertain event or race outcomes. What is permitted by the state currently is live horse racing taking place on licensed tracks, on-track pari-mutuel betting and on-track simulcasting’s? Apart from Indian Gaming Regulatory Act Licensed Native American casinos, other gambling-related activities that the state permits include league bowling at alleys with prizes not exceeding $1,000, bingo, millionaire parties and recreational card games at senior citizen facilities. What is banned by the gambling laws in Michigan is the gambling in grain, produce or stocks, registering bets and pool selling. What massively affects gambling in all U.S. states currently is that legalised online gambling could be a reality in 2018. It all actually started in mid-2017, when the legislators in Pennsylvania sighed a bill that regulates and authorise online gambling. This made Pennsylvania the fourth state in the U.S. alongside Delaware, New Jersey, and Nevada to authorise online gambling. Several land-based casinos in Pennsylvania have already applied for iGaming licenses to team up with developers to power their internet gambling portfolios. Coming back to Michigan laws, there are currently a set of bills that could change the rules regarding online gambling in the state. Learning from the events in Pennsylvania, state representative Iden seems keen to set up online gambling opportunities in cooperation with casinos that already exists in Michigan. The benefit of legalising online gambling is that the state could tax and regulate gambling activities and at the same time provide its citizens with a legal way to enjoy casino games. 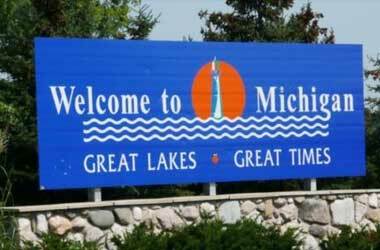 It comes as no surprise to the state of Michigan that thousands of residents are already participating in online gambling at offshore online operators. All hopes were placed on the fact that the Michigan online gambling bill would pass before the summer as the state representative put forward bill HB4926 proposing the legalisation of online betting and gambling. It did not meet the approval of the House of Representatives within the time-frame the representative anticipated. New hopes are now placed on receiving approval of the bill from the house before it closes for summer vacation on the 21st of June. When the bill was discussed, it is only natural that the House of Representatives had many concerns and questions. The main concerns are the tribal support of the bill as they fear exclusion from online gambling while the proposed bill also lowers the operator tax rate to 8% from 15%, in an attempt, to attract potential investors. By the end of the year, should it meet the house’s approval, the Senate’s vote could lead to the approval of bill HB4926. Until such time, Michigan players are accepted and welcomed with open arms by hundreds of online operators keen to shower them with generous bonuses, which doubles their bankrolls and chances of profiting from online gambling. Registration at online casinos require only a few details, and the process hardly takes 5 minutes of your time, while the gaming selection at premier online operators includes hundreds of slots, an array of different variations of blackjack, roulette, poker and baccarat plus most casinos also offer live dealer games. Sports enthusiasts can use the same login and password to enjoy casino gaming and place bets on all major sports events, while often the online odds are far better than that offered at land-based bookmakers. While Michigan’s representative is working on answers to satisfy the house’s concerns and questions, thousands of residents can enjoy the largest selection of casino games in the comfort of their home, office or anywhere else via desktops, laptops or handheld devices. Apart from the extensive gaming range available 24 hours a day at online casinos, it is the generous bonus system that appeals to Michigan residents. Although online casino games offer a higher return to player percentages and the bonuses are super attractive it is still important that residents find an operator they can trust and rely on. Online operators that are Malta Gaming Authority, Government of Curacao or U.K. Gambling Commission approved, regulated and licensed are the safest bet. The mentioned authorities have strict rules in place regarding fair gaming, fast payouts, and puts player safety at the top of the priority list. Should any player feel that his/her treatment at an online casino was unfair, these are the gambling commissions that take fast action to resolve such situations instantly. Online casinos survive in the most competitive industry and therefore know how to use their marketing skills to provide online players with unbeatable bonus offers. The most popular bonuses applied to the recruitment of new members include the no deposit required casino credits or free spins offers available exclusively to anyone of legal age registering for the first time. Welcome bonus instantly double or triples the first deposit, while the first three or four deposits are rewarded with high percentage bonuses. To ensure members stay loyal to one casino, each online operator has several fantastic dailies, weekly and monthly promotions that are exclusive to members. Loyalty reward programs use point systems to provide regular players with additional bonuses while reaching VIP status opens the door to personalised offers, invitations to VIP exclusive events such as major matches, opening theatre nights and cruises. VIPs also have access to assistance via dedicated accounts managers 24 hours a day all year round, not to mention priority payouts and higher point conversion rates. At online casinos, the sky is the limit when it comes to betting options. Basically, each player is in control of how much or little he/she wants to spend. It also depends on the game type, although slots are the most popular and for a single payline the minimum betting is just $0.01. At the same time, the maximum betting is created to cater to professional gamblers or high rollers, and any game can cater for all budgets via customizable betting options. For players from the U.S. casino funding was a bit of a challenge for a while, when banks were restricted from processing transactions to and from online casinos. While many punters quickly found a way around it, the arrival of cryptocurrencies was welcomed by most since it offers an extra layer of protection and anonymity. The deposit and withdrawal methods available at most online operators include credit/debit cards, e-wallets, and bank transfers. The payout term at online casinos differs slightly, although what determines the time cash takes to reflect in members banking accounts is the method selected for withdraws. Debit cards and credit cards take 3 to 5 day, e-wallets take as few as a couple of hours but can be as much as a day or two, and most casinos offer cryptocurrency payouts within an hour or two, or even instantly.